This post is written by Anna Bisaro and originally appeared on Medill Reports, a project of Northwestern University graduate journalism students. Sustainability. The magic word that rings with the promises of a better world and cost savings. People want to create clean energy, recycle wastes and eat locally-grown food, all in the quest for sustainability. But what about the nanoparticles people cannot see which are growing in popularity in industry, agriculture and all along the path to sustainability and innovation? Nanoparticles are designer molecules that can customize just about any product as used today in cancer treatments, medical diagnostics, batteries, solar cells and even sunscreen. But, the potential effects of these particles on living things, as well as on the environment, remain unknown. Preliminary research by the Center for Sustainable Nanotechnology lab at Northwestern University is finding that nanoparticles could affect cellular membranes. 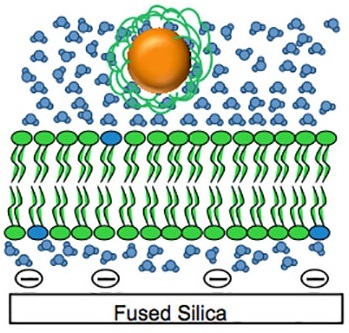 An illustration of what the lipid bilayers, representative of cellular membranes, look like in a constructed cell, supported by silica. Northwetern researchers are looking at how gold nanoparticles interact with cells. “There are many compounds in the environment where we know they are not environmentally benign,” said Northwestern chemistry professor Franz Geiger. We found out too late about the dangers associated with asbestos and chlorofluorocarbons. “Was that predictable?” he said. Continue reading on Medill Reports.